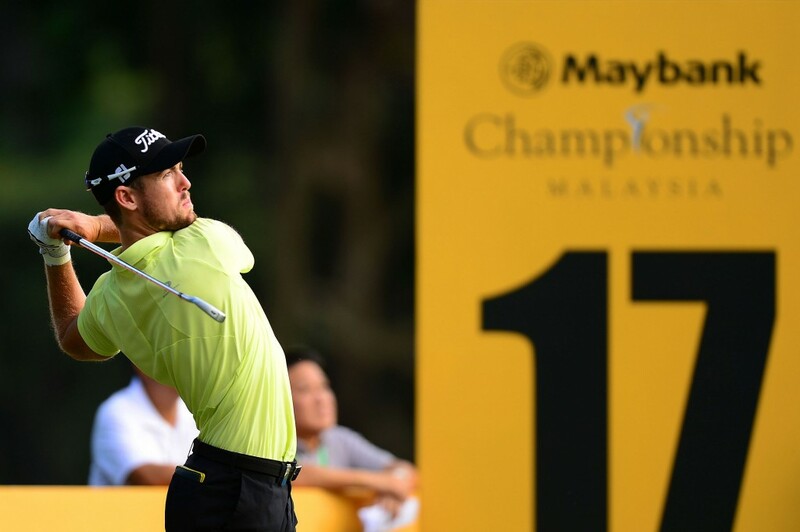 Australian Nathan Holman fired a flawless seven-under-par 64 to seize the first round lead at the inaugural Maybank Championship with Filipino ace Angelo Que leading the chasing packon Thursday. The 24-year-old Holman needed only 27 putts, including nine one-putts, at Royal Selangor Golf Club to lead in the US$3 million event jointly sanctioned by the Asian Tour and European Tour. The colourful Que, nicknamed “Human Highlighter” for his bright sense of dressing, also sank seven birdies but a lone bogey on the 16th hole saw him end the day alongside Jorge Campillo of Spain, Frenchman Alexander Levy, American Peter Uihlein and English duo Tommy Fleetwood and Danny Willett, who is the world’s number 13. Thailand’s Prom Meesawat, Thongchai Jaidee, Korean duo K.T. Kim and Soomin Lee and Filipino Miguel Tabuena, who nearly withdrew due to food poisoning, were amongst those lying a further shot back with 66s. Holman, who has featured on the Asian Tour over the past two seasons, was rock steady and whenever he found trouble, he got up-and-down on four occasions to keep the bogeys off the card at Royal Selangor, which is the second oldest golf course in Malaysia. “There’re a lot of chances but you get in the rough and it can really grab you, so seven under, I’m really happy with that,” he said. Que, decked in bright orange and yellow apparel, also enjoyed a good day on the greens, needing only 25 strokes to give himself a chance of ending a nearly six-year title drought. “I holed a lot of putts and that’s what you need to do in a tournament, especially on this course. I did that today. It is hard to hit it close if you miss the fairways. Luckily for me, I read the lines and holed my putts,” said Que. “I like old style layouts where you have to work the ball a little bit. The course isn’t that long and I like that. Malaysia has been good to me. I played well here in Malaysia over the past 14 years,” added the Filipino, whose last Asian Tour victory was in the country in 2010. Veteran star Thongchai, the only player to lift three Asian Tour Order of Merit titles, struggled with his driver but his flat stick kept him in the hunt for a 14th Asian Tour victory. “I didn’t have good drives but my putting helped me. I was bogey free and I felt very confident on the greens. I have no complaints. If you hit it on the green, you will have a good chance to score because I like the green speed,” said the former Thai paratrooper. Reigning Philippine Open champion Tabuena rose from his sick bed to shoot a fine 66. He came down with food poisoning on Tuesday and was in bed the whole of yesterday. “It was a good thing that I had a late tee time for some extra rest. I was really, really sick both ways on Wednesday and Tuesday. I thought of withdrawing but you don’t want to miss a prestigious event like this,” said the 21-year-old. The 31-year-old Prom, a double Asian Tour winner, conceded he got lucky en route to his six-birdie round as he ended the day two off the pace. “I didn’t expect to shoot five-under because I didn’t hit it as good as I did during the practice round. I started with birdie, birdie and tried to find the fairway. You must hit a lot of greens here and find fairways to have a good score,” said Prom. Willet, the highest ranked player in the field, holed a snaky birdie putt on his last hole to feature amongst the leaders. “It was a very mixed bag. I hit it very nicely on the front nine but made nothing. It was one of those days where you put two very different nines together and got a good score,” said the in-form Englishman, who won in Dubai two weeks ago. 64 – Nathan HOLMAN (AUS). 65 – Angelo QUE (PHI), Danny WILLETT (ENG), Tommy FLEETWOOD (ENG), Peter UIHLEIN (USA), Alexander LEVY (FRA), Jorge CAMPILLO (ESP). 66 – Prom MEESAWAT (THA), K.T. KIM (KOR), Richard BLAND (ENG), Thongchai JAIDEE (THA), Miguel TABUENA (PHI), Soomin LEE (KOR), Marcus FRASER (AUS), Masahiro KAWAMURA (JPN). 67 – Thitiphun CHUAYPRAKONG (THA), Gaganjeet BHULLAR (IND), Louis OOSTHUIZEN (RSA), Shaaban HUSSIN (MAS). 68 – Kenneth DE SILVA (MAS), Robert ROCK (ENG), HSIEH Chi-hsien (TPE), Rahil GANGJEE (IND), Stephen GALLACHER (SCO), James MORRISON (ENG), Chapchai NIRAT (THA), Romain WATTEL (FRA), David LIPSKY (USA), Maximilian KIEFFER (GER), Thriston LAWRENCE (RSA). 69 – Kalem RICHARDSON (AUS), Juvic PAGUNSAN (PHI), Rafa CABRERA-BELLO (ESP), Siddikur RAHMAN (BAN), Andrew DODT (AUS), Anthony WALL (ENG), Kristoffer BROBERG (SWE), Eduardo DE LA RIVA (ESP), Mikko KORHONEN (FIN), Anthony KANG (USA), KJ LOW (MAS), Chawalit PLAPHOL (THA), Thaworn WIRATCHANT (THA), Chris WOOD (ENG), Graeme STORM (ENG), Natipong SRITHONG (THA), KOH Deng Shan (SIN).